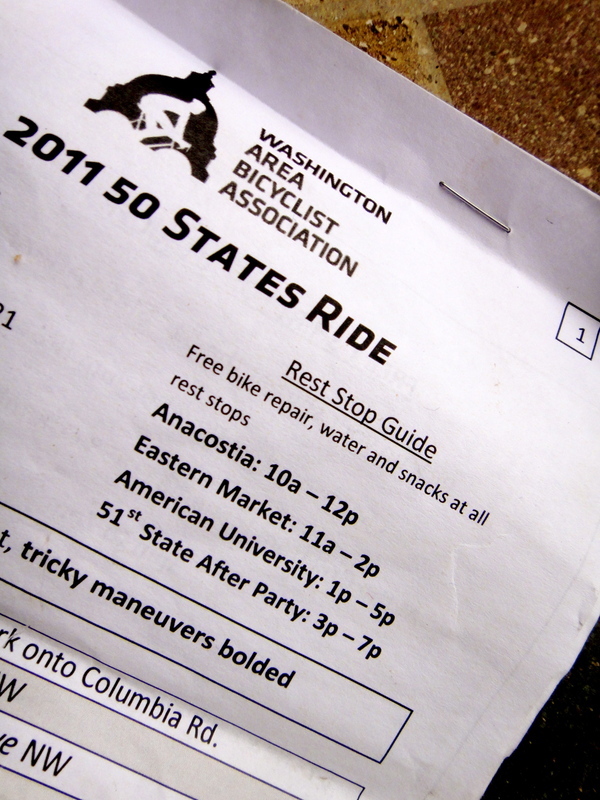 This past weekend the Washington Area Bicycling Association (WABA) hosted its annual 50 States Ride. This urban cycling event meanders through all four quadrants of Washington, D.C., and passes over all 50 state streets. It’s the only ride I’ve ever done that’s 65 miles and takes 193 cues to complete. That’s 10 pages of cues. And this year’s cue sheet is 19 fewer cues that last year’s! I admire the person who put that opus together. I participated in this ride last year, and rode away from it thinking once might be enough. That changed, though, when my friends Rootchopper and Lane said they’d be riding. Felkerino and I decided we’d join in the fun and make the most of the adventure. In fact, we had a great time. It was a pretty mellow crew that gathered in Kalorama Park on Saturday morning and the WABA volunteers did an excellent job of getting everyone smoothly through registration. It was fun to walk around and see all the different people participating and the diverse selection of bikes. 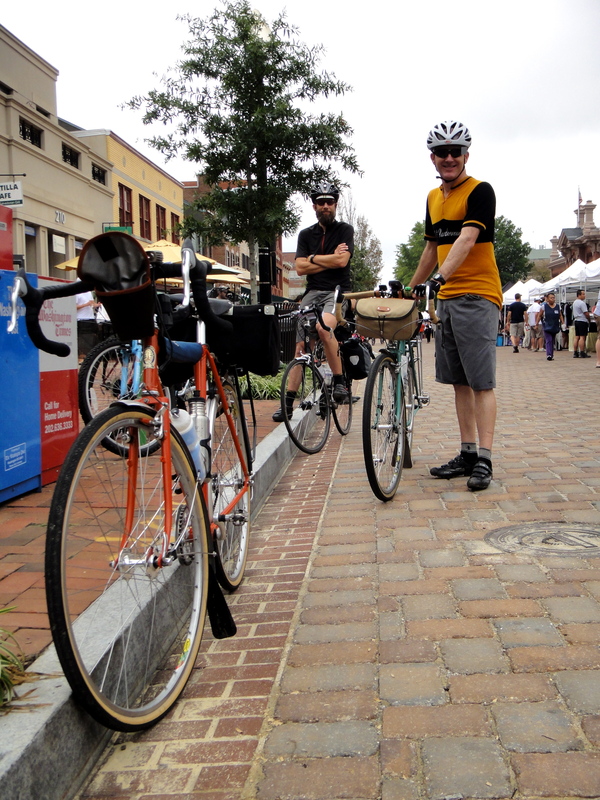 Mixties, mountain bikes, custom tourers, vintage treasure, fixed gears, city bikes… they were all there. Lane rode his Bilenky, Felkerino was on his Rivendell Atlantis, and I picked the Rivendell Quickbeam as my steed of choice. I figured if it rained, the Quickbeam would be the easiest bike to clean and the single speed experience would give a different perspective on the event. 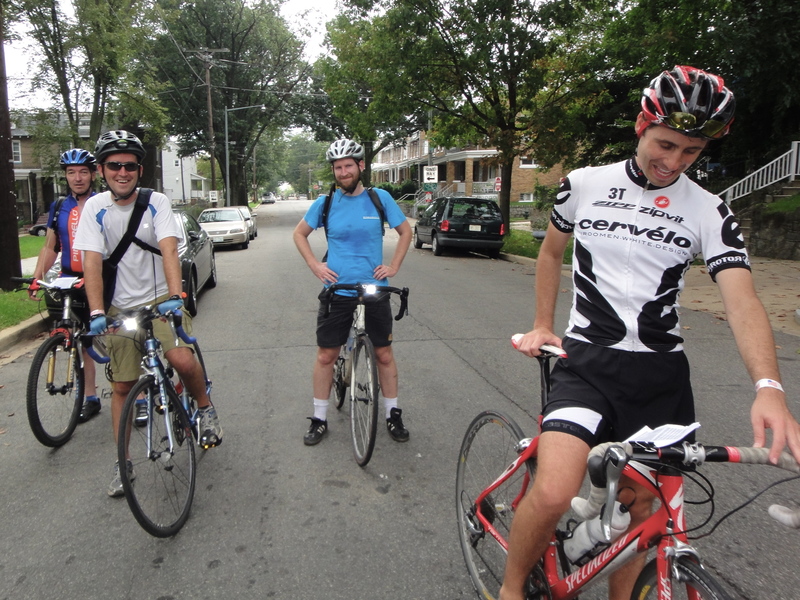 Felkerino and I also wore our D.C. Randonneurs jerseys to represent our club. Maybe it was a little overkill for a 65-mile ride, but they were comfortable and made for good conversation starters. After some announcements that I could not hear, we began our day. I spent a few miles examining the cue sheet, pedaling from light to light, checking out bikes, and saying hello to people (including Tweep @nikki_d! ), until we reached the epicenter of the city. 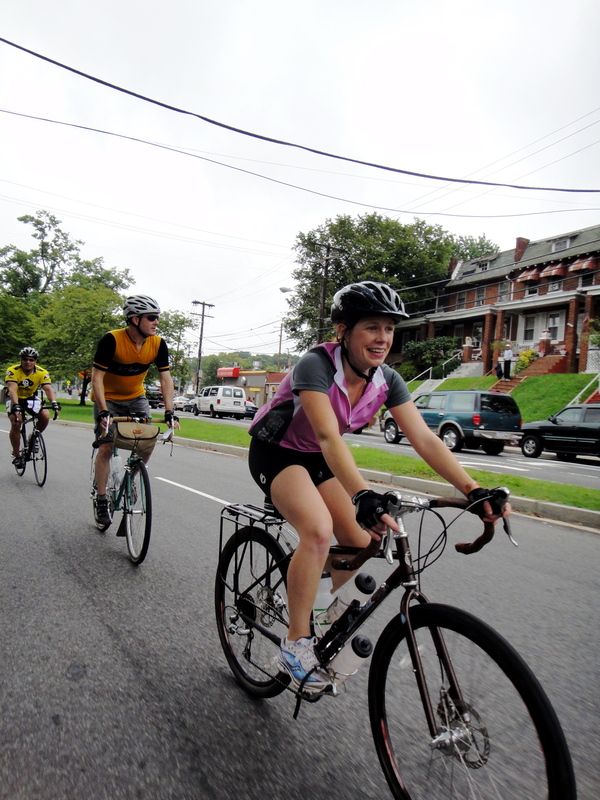 The ride starts in Adams Morgan and then takes riders through the heart of downtown D.C. The heart of downtown means lots of stoplights. LOTS! And for some reason, it seemed like most of them were turning red as I approached them. Go. Stop. Go a little more. Stop. The ride started feeling like a bad commute and I was gritting my teeth. When Lane, Felkerino, and I reached Chinatown we took advantage of the proximity of Chinatown Coffee and decided to divert for cappuccino and croissants. Since you only lose bragging rights for not staying on course, our little group chose to alter the route and morph it into a variation of the 50 States Ride. Our ride became the 50 States Minus a Few States Ride. First, we decided to skip the Southwest quadrant since that is our quadrant of residence, we ride there all the time, and the road construction on Maine Avenue is giving me a headache. We cut through the Capitol and rejoined the 50 States Ride in Capitol Hill and the Southeast quadrant. We crossed the Anacostia River via Pennsylvania Avenue and the Sousa Bridge (which seemed to have a little less debris on it this year, yes!). A few miles later we were treated to our first official rest stop of the day. WABA and Bicycle Space did a great job with this stop. It was close to bathrooms, offered oranges and refills on water, and Bicycle Space distributed free patch kits there. Thanks, guys! At this point we were 15 miles (including our shortcut) and two rest stops into the ride. 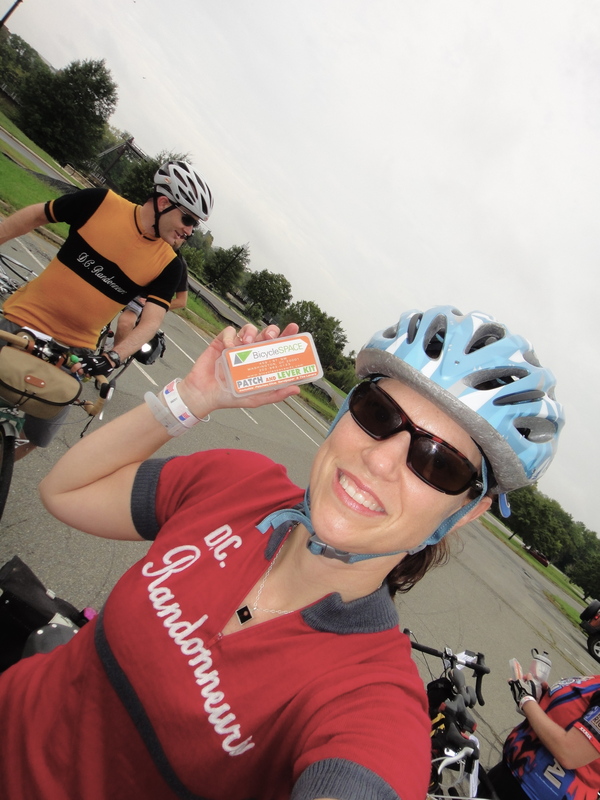 Let me just say, the 50 States Ride is not a brevet! Also, despite how it looks, we have actually ridden brevets before. But yeah, the 50 States ride is not a brevet. It is to be savored like a good glass of port. So you see, our rest stop/shortcut approach was deliberate. We continued through Southeast and fell in with a fine group of riders. The hills started to put in an appearance, too, and the stoplights became less frequent. Yippee! I enjoyed seeing the streets and feeling the undulating terrain of Southeast below my pedals. I began to fall into a good rhythm with the ride. Ten miles later, we returned to Eastern Market for lunch. Phew! I was starting to bonk after 10 miles of uninterrupted pedaling. Lane, Felkerino, and I went over to Peregrine for another cup of coffee and I grabbed sandwiches from the market. Over lunch, we calculated our next shortcut opportunities, and decided to stay on course through Northeast and part of Northwest. We’d then divert to say hi to one of our Northwest friends. After lunch, we fell in with another group and enjoyed chatting and passing the miles with them. I also happened to intersect with Chasing Mailboxes reader Justin. That was cool. In this section we also missed a cue, and residents were so nice to shout out and bring it to our attention. That was kind as well as unexpected. Overall, people on the route were really good to us. I did not have any issues with aggressive drivers and we even had a few people on the course cheer us on! Due to an impending shortcut, we had to leave our post-lunch Northeast/Northwest group after 15 miles. We skipped a few more states, visited our friend Lisa, and ate lemon-lime popsicles. Delicious! We rejoined the route just in time to descend into Rock Creek Park and climb out of it via Oregon Avenue. Eight miles later, we finally made it to the last rest stop at American University, ate bananas, admired a few bikes, and started plotting our return home. 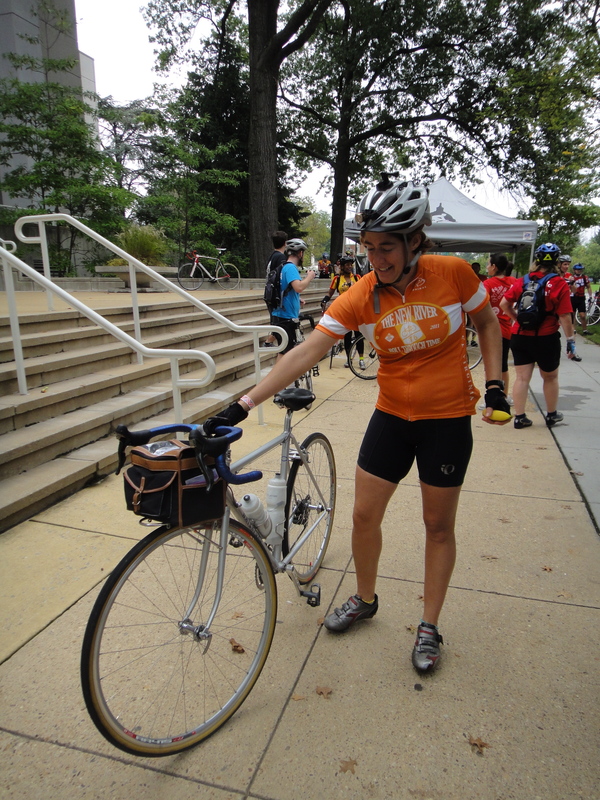 While there, we also ran into fellow D.C. Randonneur Calista, who was riding her beautiful new Waterford. After chatting with Calista, we again diverged from the route and set off toward home, stopping at the official finish along the way to thank WABA and see if anyone we knew was there. We saw a couple of familiar faces and picked up a finishing t-shirt. Did (most of) the ride. Got the T-shirt! All told, we cut 12 miles off of the official 65-mile route and completed 40 of the 50 states. Sadly, one of the states we did not pass was my home state of Iowa. Grr. Oh well. I’ll be back to ride on you next year, Iowa! My first time doing this ride, I refused to veer from the route. I really wanted to ride all 50 state streets. Anything less, and I would have gone home disappointed. This year, I didn’t care as much about that. I just wanted to ride my bike in some unfamiliar areas of the city. I looked at the event more as the Four Quadrants Ride (or Three Quadrants Ride, as reality would have it), as opposed to a 50 States Ride. Since no one else in our group cared about bagging all 50 state streets, we discarded certain portions of the ride that were either: 1. areas we ride all the time and did not feel like riding; 2. congested; or 3. conspiring against us via the traffic lights. Eliminating or limiting those parts of the city made for a better overall ride experience. The Quickbeam ended up being a perfect choice for the day. While sections of the course were fairly beat up and bumpy, that’s nothing new for the city. My 32 mm tires were perfect for the city surfaces and I just kept my eyes peeled for any uneven patches. The Quickbeam was also fun to ride on the short urban climbs. And I don’t have to clean it because, despite the forecast, we had no rain! Quickbeam at the American University rest stop. Good job, bike! Wearing the D.C. Randonneurs jersey turned out to be a good move. We got lots of compliments on the jersey and questions about the club. I felt like a D.C. Randonneurs ambassador although, as I said, I’m not sure we presented ourselves as very credible randonneurs with all our shortcutting and stopping. I took pictures throughout the ride, and the full set is here. If you see anybody you know, please feel free to comment or tag them. Thanks to WABA for the event, and to the organizations that supported the 50 States Ride, including: New Belgium Brewery (so glad we got t-shirts! 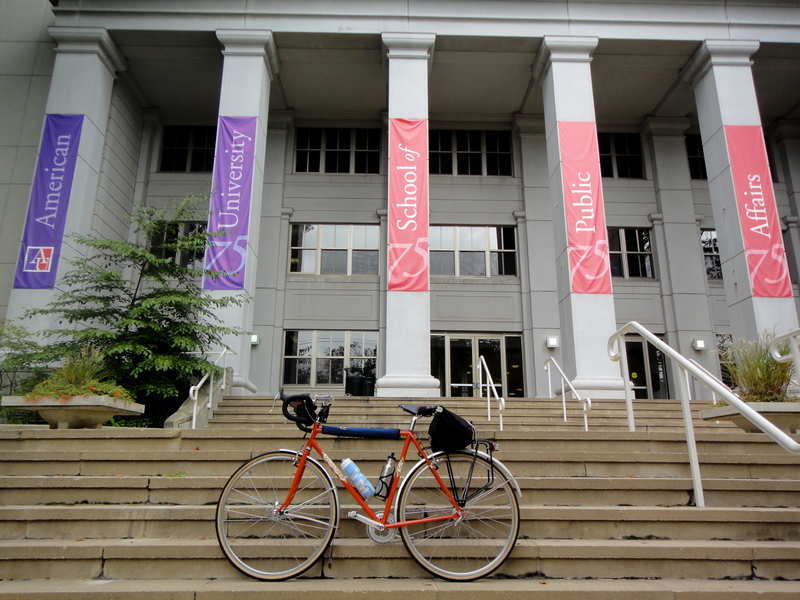 ); Bicycle Space; The Bike House; and the American University Cycling Team. 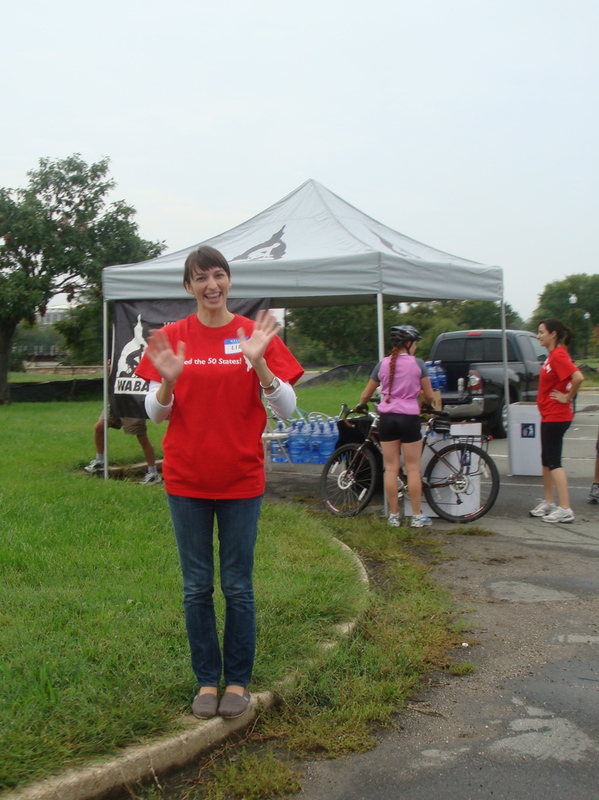 You helped me get to know my city, as well as my fellow cyclists, a little better. It was fun, and I hope to be back next year! Nice meeting you as well! It was a great adventure, I had a blast. I think that’s me in the “NW Quadrant” photo. Since this was our first time, we tried to be sure to bag all 50. Had a small, uh, detour down Wisconsin after Nebraska, but figured it out eventually. Although looking back I think we may have missed Texas Ave… anyway, it was great to chat with all the other riders, what a great time. Already thinking about next year. Yes, that is you! Good job sticking to the route, even if Texas somehow passed you by. Where was that street, anyway? You’re also in at least two pics in the flickr set. We skipped the rest stop in Anacostia having just stopped to fix a flat near the Capitol. We bagged all 50 states including Iowa! Two of our crew had to leave after Eastern Market but we picked up Tito and his beautiful bike with wooden rims (you took pix of his bike). Traffic was much saner this year and our group had great chemistry. Beer and food at the Grill from Ipanema really hit the spot. Really like this post, Mary. So much fun! How dare you cut the route? bad randonneurs…..bad randonneurs. Ha Ha Ha I hope you at least road Nebrasaka? 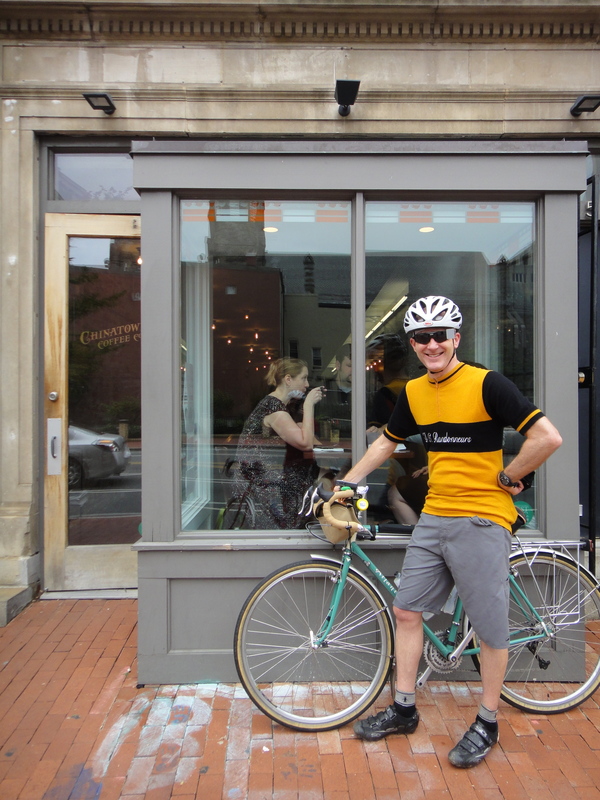 I was always amazed at the respect I got wearing a DC Randonneur jersey. Perhaps you inspired some intrest in someone. Save one lost cyclist and you save the whole world. Russ, yes, we did ride Nebraska! Maybe we will have recruited a new randonneur by our ride, but since we were bad randonneurs, it’s hard to say. By the way CONGRATULATIONS on the Korea 1000K!!! Nice to meet you! Maybe I will see you around the neighborhood.